Only a woman as infatuated with colour as Mehrbano Sethi can carry a Louis Vuitton in candy pop pink. A self proclaimed make up addict, her passion has even pushed her to melt four MAC lip paints in a sauce pan to create her perfect shade of lip colour! "It's all about having fun," Mehrbano says with that mischievous glint in her eyes. The fact that her Luscious Cosmetics Facebook page gives away five goodie bags every day and has received 10,000 fans to date demonstrates her desire to not only have fun herself but ensure that her patrons and fans enjoy themselves as well. 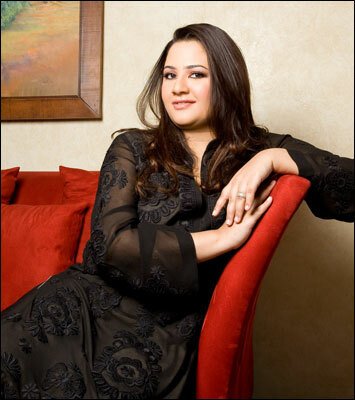 "I'd rather have four people who love my products and would swear loyalty to my brand than ten people who would get swayed away by rampant glossy advertising that is characteristic of the cosmetic industry," says Mehrbano explaining her strategy of individual personalised interaction with her consumers online, rather than opting for heavy advertising. All her ads are made by her own creative team through a collective organic brainstorming and from the looks of it, they do a brilliant job. "Make up is a fast moving consumer item. And because I manufacture all my products in the USA with stringent quality control and effective price controls, I don't have the kind of budget to advertise heavily. My products are at par with brand like NARS and Bobby Brown. I would have had a lot of funds if I chose to produce in China. As a brand we walk a tightrope as far as pricing goes to deliver a high end quality product at the most humanly affordable price." Truly with the kind of pricing and packaging that Luscious invest in (aren't those lip tubes and eye shadow case just super cool?) it's a wonder how she manages to make money. "We are actually growing at an alarmingly rapid rate," confesses Mehrbano, which doesn't comes off as a surprise one considering how affordably priced her products are. "We have grown organically over the years and since we are a private company, I can choose to produce whatever I want, a black lipstick for instance, that these cosmetic giants can't. I continue to make additions to my colour line every day." 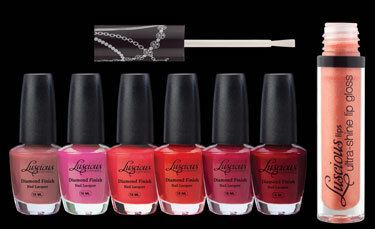 So far Luscious has branched into yummy shades of nail colour and lip pencils and colour palettes seen to be in line. But has she thought of venturing into this global trend of mineralised make up? "Mineralised make up is a fad," says Mehrbano point blank. "There are lots of loopholes in the cosmetic industry. In order for some product to be called mineralised it should just possess one kind of talc. Even these miracle creams have failed in our part of the world since they're too sheer for our skin. I'm too small to get into this sort of innovation and specialisation. I'm just concentrating on my core and receive lots of appreciation from professional women." And what of the trend of forging alliances with models and make-up artists and getting them to endorse cosmetic products as brand ambassadors? "For someone like me a brand ambassador makes no sense. My brand ambassador is the girl who buys and uses my make-up." So what else is in the offering? "I will be taking out an in-house Luscious magazine like a beauty book which will be a free publication. I am also making colour palletes in tandem with HSY's bridal winter collection so every bride who can't afford him, can have a piece of him. "Moreover, I have been researching a cutting edge skin line which will come out at the end of the year. It's going to be a skin care whitening line that will revolutionise the way we perceive the phenomenon of whitening. It's not the whole colonial hangover philosophy that we are espousing but the desire to have clear radiant skin. We are planning on taking out a completely separate line for oily skin and one for men as well." Hmmm men and Luscious? How does that work? "Would you believe it that these men salons place the most orders on my sunscreen white foundation?" exclaims an ebullient Mehrbano, "and I salute the men in Pakistan for using it!" Who wouldn't? If this doesn't prove Pakistani men have whole heartedly embraced, full metro-masculinity what does! But what gives a small local cosmetic company like Luscious an edge in a market inundated with foreign and local decades old brands? "I'm a consumer. So I understand the nature and the culture of what this nation likes or dislikes. Because I'm a private label, I can make any product to suit existing demand. We have a lot of agility that these cosmetic monsters don't have. Multinational brands are actually drug store brands that are expensive here and packaged like luxury products which they really aren't." Any future plans on how to expand the business of beauty? The company held a very successful first of its kind free makeover event in Karachi but nothing so far in Luscious' home town, Lahore. "We were planning a beauty event in Lahore but two weeks prior to it a bomb blast happened. But so far my social media networking has been very strong. My Facebook fan page attracts lots of consumers and the added benefit of winning free 'get the look' kits generates further interest and response. One thing that I learnt from the page with regards to the kit was how the bridal season shoots up demand. The portal gives me invaluable insight into the consumers' minds and demands and allows me to personally interact with them when conditions are so pressing that I can't hold events. To take the whole business of beauty forward I also want to create a make-up academy with visiting faculty. We need to take make-up seriously as we do fashion school. Right now we are not targeting professionals. All sorts of creativity is frowned upon. We need young dynamic make-up artistes who can treat make-up as art and go crazy with it!" Like melting expensive lip paints in a saucepan at age 12, I remind her, and she laughs heartily. What message can a woman like her, who doesn't conform to the 'thin is beautiful' camp but insists on being beautiful by making most of who you are and what you have, give to young girls in the country? "I want Pakistani women to become fearless. Our mothers broke through the glass ceiling so why not us? It's time to move forward. Although our brand ethos is very fun and glamorous, I want to brand those women who are passionate about their work in whichever field they are. Such as the fastest lady runner from Karachi who won at the SAARC games." Now that's what we call beauty with brains!